Extract from the Northern Times of January the fifteenth 2016, with accompanying colour photographs. 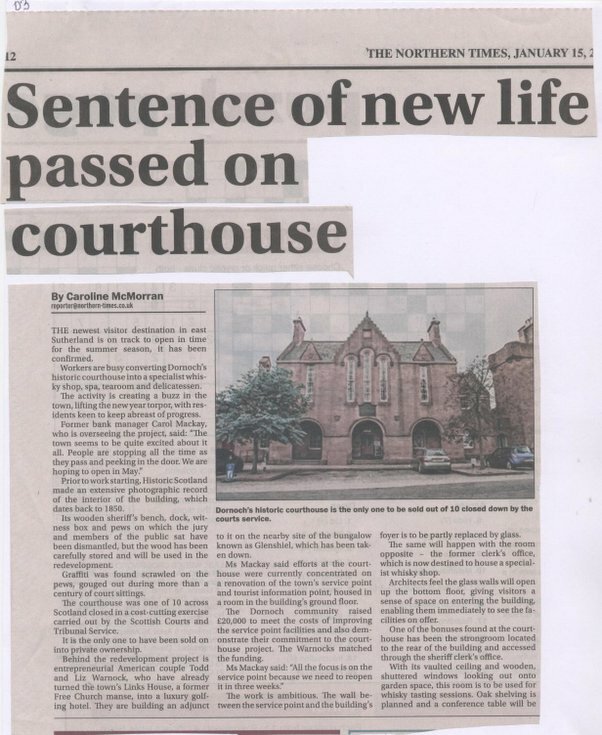 The article is headed "Sentence of new life passed on court house", and provides an account of the conversion of Dornoch's historic court house into a specialist whisky shop, spa, tearoom and delicatessen. The article ends with a report of the discovery of an inscription "Neil Grant Carpenter, Brora, 9th May 1913" on a wooden plank discovered during the renovation of the courtroom. Carol Mackay, Manager of the Courthouse posted the find on the Courthouse Facebook page resulting in follow-up from the residents of Brora that Neil Grant is commemorated on the Brora War Memorial as a Lance Sergeant 5th Seaforths who died of his wounds at home on 14 March 1917" His family is believed to have lived in Rossyln Street.